To start the New Year, perhaps we should focus on the biggest impediment. Now, of course, we don’t know the biggest impediment at your place of business, but I can tell you what I see at clients, and what makes sense to me, given human nature. 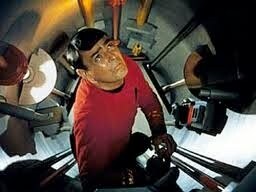 In my view, it is human nature to feel, “We canna push it any faster, captain.” (See the picture of Scotty.) Meaning: We feel we are going as fast as we can. So, we ignore impediments. We don’t even see them. The biggest impediment is a lack of focus on removing impediments. This has several manifestations and several root causes. I just mentioned one of the key causes. (To which maybe we could ask more “whys.”) But, I think that is a useful way to describe the impediment. This is serious. I think a decent ScrumMaster, with decent organizational support (helped along by his being persuasive), can double the Velocity of a team in the first six months. Do the math — would that be worthwhile at your place? P.S. Because of possible misunderstandings, I must repeat, doubling Velocity does NOT mean the team works longer hours. (No death march). Often it means the team works fewer hours than what has become ‘normal’. In fact, the team should feel that removing impediments is kind of a fun activity.